For official hardware accessories see the relevant Kinetic and Martin Lynch pages. SBS-fs is a neat utility that upgrades the firmware for the SBS-1, SBS-1e and SBS-1er. It also upgrades the BaseStation software and the SQLite DLL file. 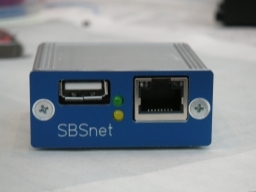 SBSnet is intended to be a bridge between the USB port of the SBS1 and an Ethernet network. It will not require opening of the SBS1 case, but uses the current USB cable and an Ethernet cable on the other side. This will make it possible to view your SBS1 flight data anywhere in your local network or the Internet.